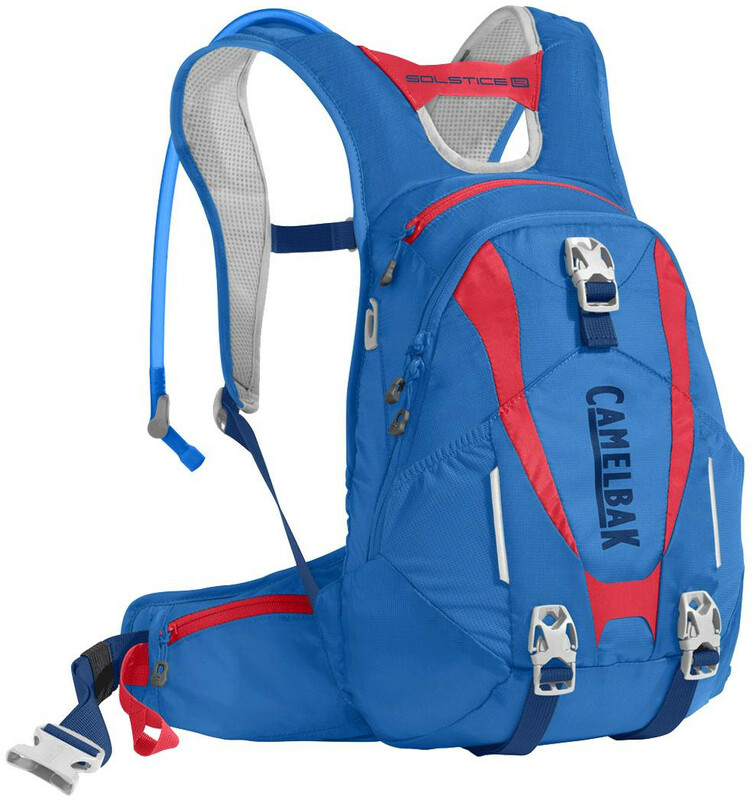 CamelBak: Our newest women’s mountain bike pack is a low rider. The Solstice™ is a full-featured pack that shifts your load—and most importantly, your water supply—down towards your waist. That small change gives you a lower center of gravity and a wider range of motion, which makes it easier to maneuver as you’re barreling downhill. The Solstice also stores enough water and gear for a full day on the trail: a 3-liter Crux reservoir, helmet hooks, attachment points for soft armor, and a tool roll to keep your gear organized. We designed the Solstice specifically for women, with an S-shaped harness that curves comfortably around your chest, and a slightly shorter back panel for a more ergonomic fit. PACK ONLY WEIGHT: 650g / 1 lb 6 oz TORSO FIT RANGE: 43-53cm / 17-21 in WAIST FIT RANGE: 66-116cm / 26/46 in FABRIC: 100D ROBIC Nylon Dobby / 210D Nylon Oxford FEATURES: • The brand new Crux LR reservoir delivers 20% more water per sip while keeping weight positioned low on your back, which translates to better stability in the saddle and on the trail. • Magnetic Tube Trap™ keeps your tube secure and accessible when you need it. • Stabilizing load-bearing hip belts with cargo optimizes a custom fit and keeps essentials close at hand. • Separate zippered compartment with gear organizer and tool roll. • Dual reservoir compression straps cinch the reservoir into the small of your back for a tight, stable fit. • Stretch overflow storage compartment lets you easily stash a rain shell or extra layer. • Reflective accents for visibility in low-light environments. • Women's-specific design features a shorter back panel and an S-curved harness for a closer fit.